Apple has been busily working to 64-bit-ify all of the frameworks they plan to continue supporting into the future (Snow Leopard and beyond). However, QuickTime is scheduled for some nice Cocoaification, so it didn’t get much 64-bit love. QTKit, the 64-bit impostor, pretends to be the 64-bit way forward, but unfortunately this is far from useful. 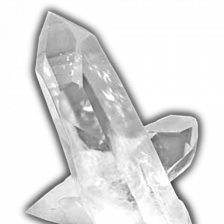 In the wee small hours of this morning, Kineme Interactive Media released its first commercial product, QuartzCrystal. 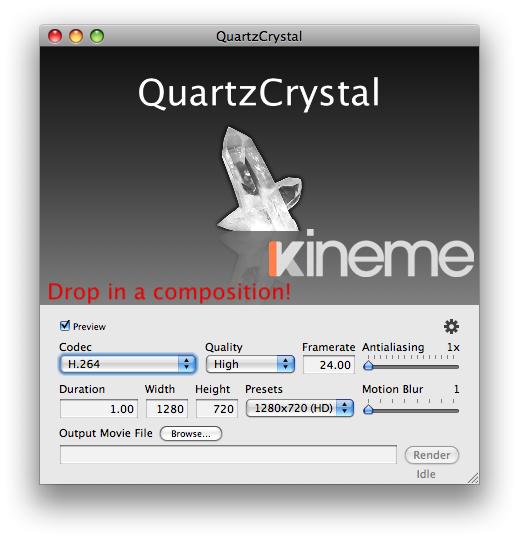 QuartzCrystal is an offline renderer that turns Quartz Compositions into portable QuickTime movies. It supports 3rd party plugins, as well as patches that do not work in safe-mode-only environments (such as QuickTime Pro). It also supports software scene antialiasing, so if you have a Mac with plenty of RAM and a hard-core video card, you can make spectacularly beautiful renderings of your plugins, effects, and compositions. Beside QuartzCrystal, the only other product that renders and encodes compositions to movies is Apple’s own QuickTime Pro, which doesn’t support plugins, unsafe patches, or antialiasing. It took a few minutes for cwright and smokris to realize what was different yesterday. Yes, the days had finally come. I had begun to shave my proverbial neckbeard. More than year after and much like similar happenings, 7/15/08 is a day that shall live in infamy. In the year that has elapsed since I failed to explain why I was using PINE for email, I’ve switched to Apple Mail. Don’t ask.